As the daytime temperatures get colder, even the weeds stop growing. This gives us the illusion of a weed free garden area from now until next spring, when we are always shocked by how rapidly and strongly weeds can grow. Some days it feels like a jungle grew overnight! For now, the hens are between rows, clearing growth at an outrageous rate. 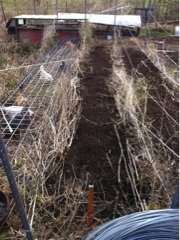 Here they are between the rows of asparagus. Next spring we will be able to harvest from here, and can hardly wait. From now until then the rows will stay clear, and then wham weeds will be shoulder height. Weeds rule, even when we think otherwise. what's under a cow pie?